Today we preview the new sitcoms announced for the 2016-17 season. There will be a total of seven new sitcoms on the fall schedule. Four are single-camera comedies. 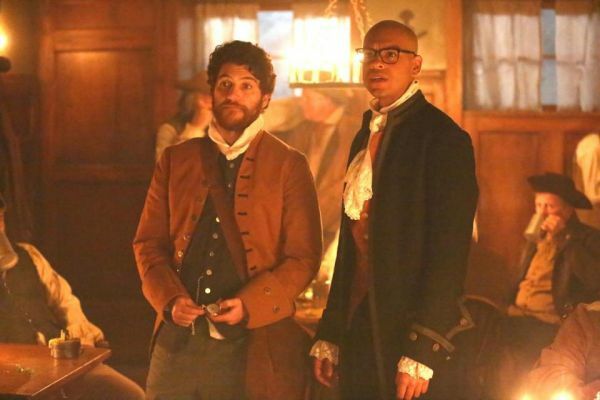 CBS adds three multi-camera sitcoms to their schedule. Eight additional comedies have been ordered for mid-season. Just one will be a multi-camera sitcom. ABC will have two-hour blocks of comedies on Tuesdays and Wednesdays. They have two additional single-camera comedies planned for mid-season. 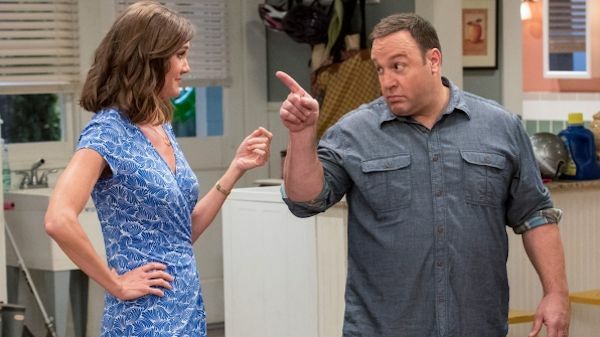 Top-rated CBS has three new multi-camera sitcoms featuring stars Kevin James, Matt LeBlanc and Joel McHale. 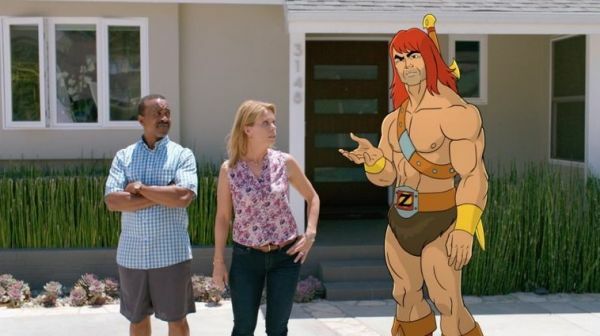 Fox adds the hybrid live-action/animated comedy Son of Zorn to their Sunday lineup. They have two additional single-camera comedies for mid-season. Ted Danson returns to NBC in their only new fall comedy. Three additional single-camera comedies are planned for mid-season. 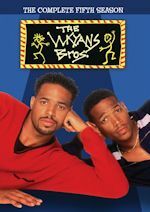 They also have the multi-camera family sitcom Marlon, which stars Marlon Wayans. 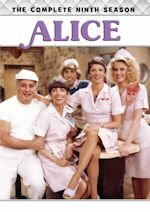 Some familiar faces returning to sitcoms this season include Katy Mixon, Diedrich Bader, Minnie Driver, Cedric Yarbrough, Lucas Neff, Jenna Elfman, Kevin James, Erinn Hayes, Lenny Venito, Taylor Spreitler, Matt LeBlanc, Joel McHale, Cheryl Hines, Adam Pally, Ted Danson, Briga Heelan, John Michael Higgins, Marlon Wayans, Alan Tudyk, Danny Pudi, John Lithgow, Jayma Mays and Sherri Shepherd. Katie Otto (Katy Mixon, Mike and Molly), a confident, unapologetic wife and mother of three, raises her flawed family in the wealthy town of Westport, Connecticut, filled with “perfect” mommies and their “perfect” offspring. 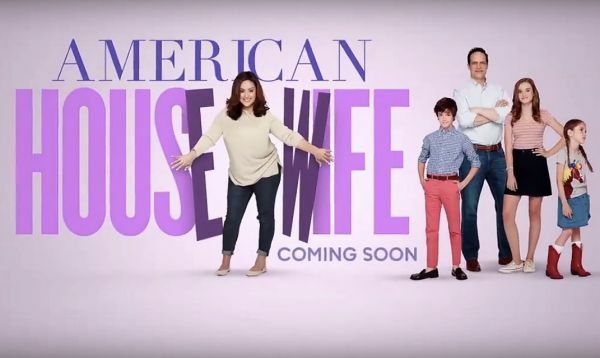 American Housewife is written by Sarah Dunn (Spin City, Bunheads) and produced by Kapital Entertainment and ABC Studios. Aaron Kaplan, Rick Weiner and Kenny Schwartz are executive producers. Ruben Fleischer directed and was executive producer of the pilot. Speechless stars Minnie Driver as Maya DiMeo, John Ross Bowie (The Big Bang Theory) as Jimmy DiMeo, Mason Cook as Ray DiMeo, Micah Fowler as JJ DiMeo, Kyla Kenedy as Dylan DiMeo and Cedric Yarbrough as Kenneth. Scott Silveri (Friends) writes and is executive producer of the show, along with Fresh Off the Boat’s Jake Kasdan and Melvin Mar. The series is from Twentieth Century Fox Television and ABC Studios. 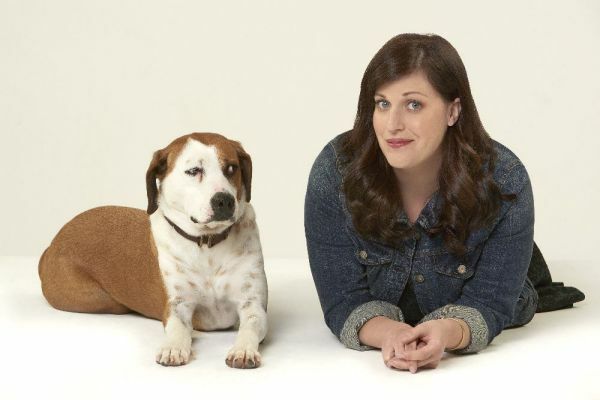 Based on the web series, Downward Dog is about a struggling millennial, Nan (Emmy-nominated Allison Tolman, Fargo), from the point of view of her lonely and philosophical dog, Martin. One session at obedience school already makes them realize that even at their worst they may be the best thing for each other. Alice (Jenna Elfman, Dharma & Greg, Friends with Benefits, EDtv) is a fiercely independent career woman whose life is turned upside-down when she meets the love of her life – a divorced father with three kids. This triggers even more upheaval when the slightly unhinged imaginary friend she created as a child suddenly reappears to help her navigate the transition from single girl to a woman ready for a family. The live action/CGI hybrid comes from The Goldbergs team Adam F. Goldberg (writer/executive producer), David Guarascio (writer/executive producer) and Doug Robinson (executive producer). Mary CG animation is designed by Patrick Osborne (creator of Academy Award- winning animated short, The Feast), who is also executive producer. The pilot was directed by Shawn Levy (Night at the Museum, Cheaper by the Dozen), who is also executive producer. The series is a co-production with Sony Pictures Television, Happy Madison and ABC Studios. KEVIN CAN WAIT stars Kevin James as a newly retired police officer looking forward to spending carefree, quality time with his wife and three kids, only to discover he faces tougher challenges at home than he ever did on the streets. Kevin’s retirement plans consist of chilling with his family and having epic adventures with fellow retirees Goody (Leonard Earl Howze), his former partner and close friend, and Duffy (Lenny Venito), his oldest pal, as well as his brother, Kyle (Gary Valentine), a fireman whose closest encounter with a blaze would be a grease fire in the firehouse kitchen. However, Kevin’s dream is jeopardized when he discovers that Donna (Erinn Hayes), his wonderful wife of 20 years, has shielded him from key family info while he worked overtime protecting the community. Their usually reliable eldest, Kendra (Taylor Spreitler), is dropping out of college so she can support her unemployed fiancé, Chale (Ryan Cartwright), while he designs the next “big app”; his teenage daughter, Sara (Mary-Charles Jones), is having issues at school; and their youngest, Jack (James DiGiacomo), is a bit of a hypochondriac. For now, his plans for a cushy life will have to wait, because Kevin has work to do, and this time, his family is his beat. Bruce Helford, Rock Reuben, Kevin James, Jeff Sussman and Andy Fickman are executive producers for CBS Television Studios in association with Sony Pictures Television. Fickman directed the pilot. 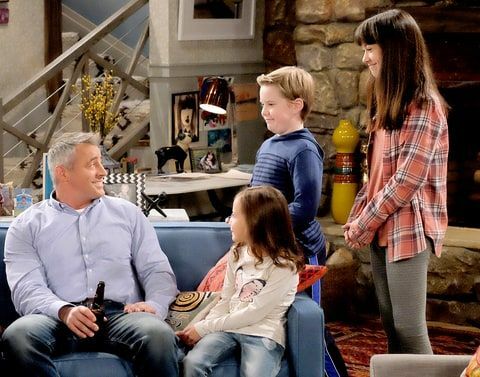 MAN WITH A PLAN stars Golden Globe Award winner Matt LeBlanc in a comedy about a contractor who starts spending more time with his kids when his wife goes back to work and discovers the truth every parent eventually realizes: their little angels are maniacs. Adam (LeBlanc) feels fully equipped to take on more parenting responsibilities while his self-assured wife, Andi, returns to the work force after being a stay at home mom for 13 years. However, Adam’s blindsided by how tough it is to wrangle three messy kids who can’t live without Wi-Fi. 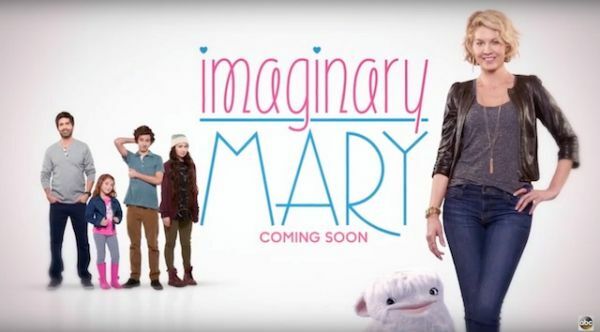 Their pre-teen daughter, Kate (Grace Kaufman), is a master manipulator and initially thrilled that “daddy fun times” is taking over, middle child Teddy (Matthew McCann) can’t seem to keep his hands out of his pants despite constant reminders, and their precious youngest, Emme (Hala Finley), is nervous about starting kindergarten. 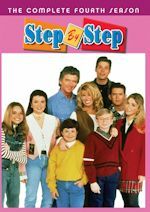 But with Andi’s encouragement and advice from a couple of equally stressed parents, Marie (Jessica Chaffin) and Lowell (Matt Cook), Adam takes charge of his brood, lays down the law and discovers he’s going to “nail” this job. Jeff & Jackie Filgo, Matt LeBlanc, Michael Rotenberg and Troy Zien are executive producers for CBS Television Studios. Multiple Emmy Award winner James Burrows directed the pilot. Note: Jenna Fischer played Andi in the pilot episode. The role will be recast. 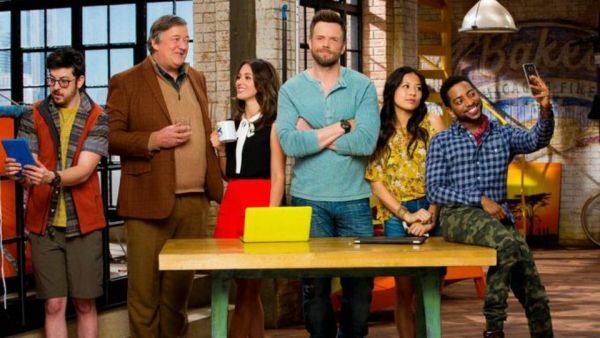 THE GREAT INDOORS stars Joel McHale in a comedy about a renowned adventure reporter for an outdoor magazine who must adapt to the times when he becomes the desk-bound boss to a group of millennials in the digital department of the publication. Jack has led a thrilling “outdoorsy” life exploring the edges of the earth while chronicling his adventures for Outdoor Limits. But his globe-trotting days end when the magazine’s charismatic founder and outdoor legend, Roland (Stephen Fry), announces the publication’s move to web-only and assigns Jack to supervise their online team of “journalists.” Jack’s eager 20-something colleagues include Clark (Christopher Mintz-Plasse), a tech nerd who knows everything about surviving on Mars and a zombie apocalypse; Emma (Christine Ko), their social media expert who views Jack as the human version of dial-up; and Mason (Shaun Brown), a hipster-lumberjack who hasn’t spent any actual time outside. Jack reports to Roland’s daughter, Brooke (Susannah Fielding), an ex-flame who caters to the sensitive staffers by giving them all trophies just for working hard. Jack’s best friend, Eddie (Chris Williams), runs the local dive bar that’s popular with the younger set and helps Jack “decode” his co-workers. Jack is baffled by the world of click-bait and listicles, but if he’s patient, he may be able to show these kids that the outside world is much more than something on a screen… if he doesn’t beat them with their selfie-sticks first. Mike Gibbons, Chris Harris and multiple Emmy Award winner Andy Ackerman are executive producers for CBS Television Studios. Ackerman directed the pilot. Featuring the voice of Jason Sudeikis (THE LAST MAN ON EARTH, Horrible Bosses, We’re the Millers), SON OF ZORN is a new hybrid live-action/animated comedy about an animated warrior from a faraway island in the Pacific Ocean – where everything and everyone is animated – who returns to Orange County, CA, to win back his live-action ex-wife and teenage son. ZORN (Sudeikis), the Defender of Zephyria, Conqueror of the tribes of Agon, decapitator of the dark herdsmen of Grith, has fought in countless epic battles throughout his life, but may find the greatest challenge of all when travels back to suburbia to reconnect with his family. Once there, Zorn finds himself estranged from his son, ALANGULON or just “Alan” (Johnny Pemberton, 21 Jump Street), a 17-year-old with a mellow, P.C. attitude; and Alan’s mother, Zorn’s ex-wife, EDIE (Cheryl Hines, Curb Your Enthusiasm), a former wild child now living the life of an upper middle class mom. Zorn’s efforts to win them back are complicated by the fact that Edie is now engaged to CRAIG (Tim Meadows, Saturday Night Live), an online psychology professor and a stable presence in their lives. Nevertheless, to be a good dad, Zorn commits to remaining in Orange County for the long haul, renting an apartment and even working in the exciting field of industrial soap sales under his boss, LINDA (Artemis Pebdani, Scandal, It’s Always Sunny in Philadelphia), who likes his passion, but just wants him to rein it in at the office. As he adjusts to life in the suburbs, Zorn is the classic fish out of water, navigating his way through fatherhood, divorce and a boring office job. Sure, as an overlord of pain, he defeated glombeasts, wolf-bats and bloodthirsty arachnobots, but now he’ll go toe-to-toe with a new set of enemies: meter maids, dress codes and the DMV. THE MICK is a no-holds-barred single-camera comedy that gives new meaning to the phrase “dysfunctional family.” MACKENZIE aka “MICKEY” (Kaitlin Olson, It’s Always Sunny in Philadelphia) is a brash, two-bit hustler from Rhode Island who has spent her entire life shirking any semblance of responsibility. Lacking any drive, but in constant search of the next easy payday, Mickey is not without her charms. She’s smart, she’s fun, and despite all appearances, her head’s always in the game. She just needs a big win. That win kinda, sorta comes true when, looking for a handout, Mickey visits her estranged sister and billionaire brother-in-law in Greenwich, CT, but gets more than she bargained for, as this absurdly rich couple flees the country to escape federal fraud charges. In a surprising turn of events, Mickey must assume guardianship of their three high-maintenance and ill-parented children: SABRINA (Sofia Black D’Elia, The Messengers, Gossip Girl), an ambitious, 18-going-on-30-year-old who is a worthy adversary to Mickey; CHIP (Thomas Barbusca, The New Normal, Grey’s Anatomy), 13, an arrogant, entitled neo-con-in-the-making with an extremely punchable face; and BEN (newcomer Jack Stanton), seven, an adorably fragile nerd. The life that Mickey has wanted for so long now is within her reach – the mansion, the convertible, the swimming pool, the walk-in closet full of designer clothes. But as Mickey is well aware, nothing in life is free. The price? Transforming these outrageously spoiled children into honest, hard-working, decent members of society – something this foul-mouthed, debaucherous and completely out-of-her-element woman knows absolutely nothing about. Being a mother was never in Mickey’s game plan, but these kids desperately need a parent. And as irresponsible as Mickey has been her entire life, she may discover that responsibility and motherhood aren’t the buzzkill she always thought they would be. From Michael Schur, executive producer of Brooklyn Nine-Nine, Parks and Recreation and The Office, comes a smart, unique new comedy that follows Eleanor Shellstrop (Kristen Bell, House of Lies, Veronica Mars), an ordinary woman who, through an extraordinary string of events, enters the afterlife where she comes to realize that she hasn't been a very good person. With the help of her wise newfound afterlife mentor (Ted Danson, Bored to Death, Cheers), she's determined to shed her old way of living and discover the awesome (or at least the pretty good) person within. Directed by Drew Goddard, the Oscar-nominated writer of The Martian. Michael Schur serves as writer and executive producer. David Miner also executive produces. Drew Goddard directs. The Good Place is produced by Universal Television and 3 Arts Entertainment. Getting along with some colleagues can be rough, but working with your mom? That's a whole other story. 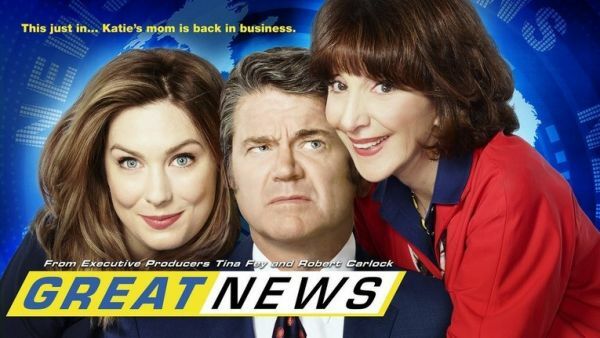 When Katie, an up-and-coming news producer, finds out her overbearing mom (Andrea Martin, SCTV, My Big Fat Greek Wedding) has rejoined the workforce as an intern at the station where Katie works, it might just be the worst news ever. But, with her biggest cheerleader at her side, Katie might finally get the recognition she deserves. The laughs hit close to home in this new office comedy from executive producers Tina Fey, Robert Carlock and the producers of 30 Rock. Tracey Wigfield serves as writer and executive producer. Tina Fey, Robert Carlock and David Miner also executive produce. Beth McCarthy-Miller directs. Great News is produced by Universal Television, Little Stranger and 3 Arts Entertainment. 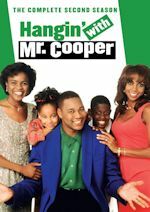 Loosely inspired by the real life of star Marlon Wayans (In Living Color, Scary Movie), this update to the classic family comedy centers on a loving (but immature) father committed to co-parenting his two kids with his very-together ex-wife. While his misguided fatherly advice, unstoppable larger-than-life personality and unpredictable Internet superstardom might get in the way sometimes, for Marlon family really always does come first - even if he's the biggest kid of all. The cast includes Marlon Wayans, Essence Atkins, Notlim Taylor, Amir O'Neil, Bresha Webb and Diallo Riddle. Christopher Moynihan serves as writer and executive producer. Marlon Wayans, Rick Alvarez, Michael Rotenberg and director Andy Ackerman (pilot) also executive produce. Marlon is produced by Universal Television, Wayans Brothers Entertainment, Bicycle Path Productions and 3 Arts Entertainment. 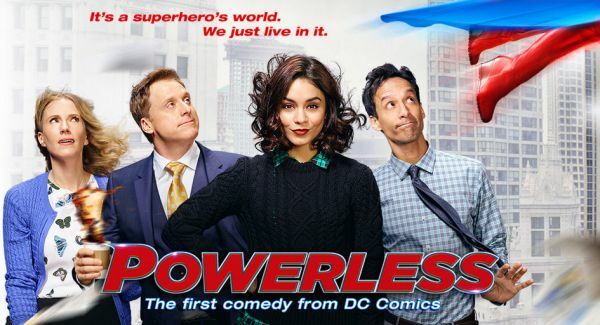 In the first comedy series set in the universe of DC Comics, Vanessa Hudgens (Grease Live, High School Musical) plays Emily, a spunky young insurance adjuster specializing in regular-people coverage against damage caused by the crime-fighting superheroes. It's when she stands up to one of these larger-than-life figures (after an epic battle messes with her commute) that she accidentally becomes a cult "hero" in her own right ... even if it's just to her group of lovably quirky co-workers. Now, while she navigates her normal, everyday life against an explosive backdrop, Emily might just discover that being a hero doesn't always require superpowers. In this outrageous fish-out-of-water comedy, bright-eyed New York lawyer Josh Segal heads to a tiny Southern town for his first big case. His mission? To defend an eccentric, "rollercizing" poetry professor (John Lithgow, 3rd Rock From the Sun) accused of the bizarre murder of his beloved wife. Settling into his makeshift office behind a taxidermy shop and meeting his quirky team of local misfits, Josh suspects that winning his first big case will not be easy, especially when his client is always making himself look guilty. Making a Murderer can be funny! Jeff Astrof and Matt Miller serve as writers and executive producers. Jeffrey Blitz directs. 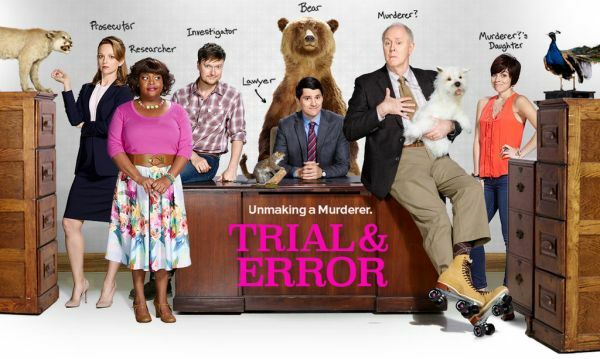 Trial & Error is produced by Barge Productions and Good Session Productions in association with Warner Bros. Television. Which new sitcoms are you looking forward to this fall?